Affordable Language Services’ founder and CEO Lynn Elfers has served as a pioneer in the industry for decades, dedicated to the advancement of education and the cause to make significant impact on the translation and interpretation community. The Executive team is made up of professionals who have diverse experience in client management, leadership of a large full service talent acquisition agency, software implementation and business process optimization through technology innovation, workflow engineering and process efficiency. 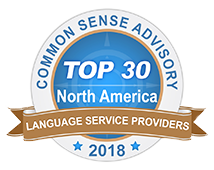 We are certified as a Top 40 Language Service Provider (both interpreting and translation) by the industry leading Common Sense Advisory Council. Not only are we top rated in North America, we are #1 in Ohio and our Tri-State region! We are Globally Ranked #12 On-Site Interpreting Company in 2015 by The Common Sense Advisory of the largest providers of language services based on the amount of reported revenue. Affordable Language Services is committed to our clients’ success by working as a partner to understand the unique needs and complexities of every company and provide customized solutions resulting in precise messaging, accurate internal resource allocation and maximized cost savings. We have proven quality systems, language and cultural localization resources and documented quality assurance (QA) processes. We pride ourselves in the quality of language services we offer for 130 languages (including American Sign Language). Further, our staff of more than 600 trained professionals can cover lesser known languages that other companies often do not have the means to cover — and our clients can reach us 24/7. Affordable Language Services is ISO 9001:2015 Certified, an internationally recognized standard for quality management systems. This is one of the highest certifications a company can receive, and we are one of only ten language service providers worldwide to have achieved this certification. This demonstrates that we have an effective and documented process for the delivery of our interpretation and translation services. It also displays that our management team is committed to the highest standards in reviewing these quality processes to support continual improvement. At Affordable Language Services, we don’t just work with clients at one level within a company, we work with both leadership on strategy and planning as well as those employees directly utilizing language services daily. We are a total resource solution for translation projects with subject-qualified translators, interpreting projects in spoken languages and various forms of sign language as well as talent acquisition. We generate flexible solutions by providing a dedicated project team committed to the success of the organization’s goals and objectives. Our solution optimizes hiring, onboarding, job performance and ongoing compliance responsibilities. Affordable Language Services is a one-stop shop for all your talent acquisition, interpreting and translation needs. We are the solution that gives our clients an affordable advantage over our competitors. Contact Us / Request a Quote today to see how our staff can meet your specific interpreting or language translation needs. I honestly can’t think of a single thing that could have been better about our experience using Affordable Language Services. Thank you so much for working with my request to expedite the service! Your services are greatly appreciated! I have had poor experiences with other translation services in the past and so was very happy to have found your service! This was a rush order and you all came in ahead of the 5:00 pm deadline – I could not be more satisfied. THANK YOU! !